Attics and conservatories often store 100's of kWhs of free solar heated attic air. Now a smart new system is available that automatically transfers and measures all this free heat to your home, when it is available and required, to reduce home heating costs. Solar energy conducted through attic roofs or transmitted into conservatories heats the enclosed air to surprisingly high temperatures that can exceed 50°C. A recently developed extremely efficient Solar Space Heating system moves the free hot attic air or hot conservatory air to heat living areas to reduce home heating costs. In homes that have existing heating systems the new system reduces the time that the existing heating system operates reducing heating costs and extending the life of your heating system. Automatic Solar Heat Harvesting Systems were designed, tested and developed in homes between 2011 and 2018, one of these is in Balerno near Edinburgh, Scotland, one is near Toledo, Ohio USA, and one is in Mullion Cornwall. Tests showed that usually to achieve room temperatures of more than 20°C (68°F), system peak periods for using solar heated attic air occur whenever average daily outdoor temperatures are between 7 and 18°C (44 and 64°F). The time of year when average outdoor temperature is between 7 and 18°C is variable but often determined by your home's latitude. The following world chart gives an indication of when and where peak solar heating periods are most likely. However latitudes for peak Solar Heat Harvesting in homes near coasts will usually be higher, and at higher elevations, lower. 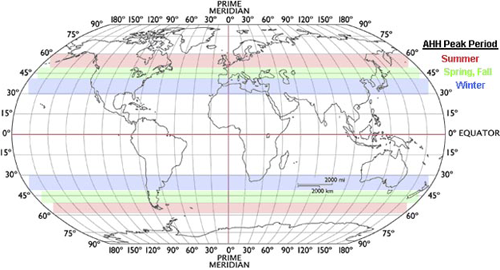 The number of hours of sunshine per month is also a very significant factor, high monthly sunshine hours increase the latitude of the peak period. 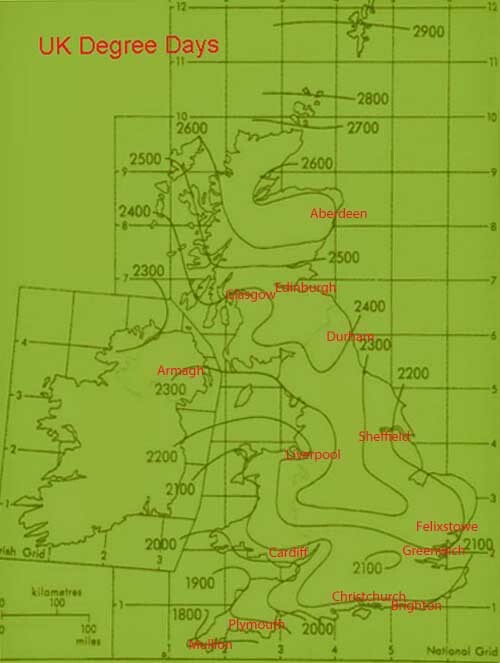 The following charts show Edinburgh UK and Brighton UK average climates, the shaded areas show peak periods for solar heating. When home temperatures are above the controller user defined maximum room temperature the automatic Solar Space Heating system will not operate. At northern UK latitudes the peak period for using solar heated attic air is from May to September, at southern UK latitudes it is during spring and autumn. This map gives an average measure of how much heat is required each year to heat a UK building. Heating Degree Days (HDD) is a measurement designed to quantify the demand for heating energy which is derived from measurements of outside air temperature. Get more detailed monthly climate infformation for these towns: Aberdeen, Glasgow, Edinburgh, Durham, Armagh, Liverpool, Sheffield, Oxford, Felixstowe, Cardiff, Greenwich, Christchurch, Brighton, Plymouth. Average monthly climate information for charts on this website were obtained from www.metoffice.gov.uk/climate/uk/averages, www.climatetemps.com and from www.holiday-weather.com. A Solar Heat Harvesting System offers you and our planet the most efficient way to reduce home heating costs. It uses hot solar heated attic air, or solar heated hot conservatory air, which is extremely efficiently moved into your home. The system is inexpensive, very reliable, simple to maintain, and the payback time can be measured in months rather than years, or decades, or never.